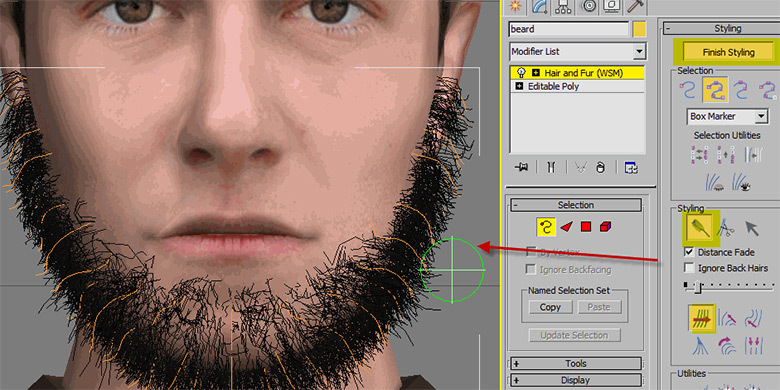 Hello there, Welcome, in this tutorial we will learn how to create facial hair for our character using 3ds max hair and fur modifier, this modifier gives you the freedom to create realistic hair and fur for your projects which I could say is fantastic, there is few more ways to add hair for your characters but this is more hassle free once you get to understand it, thanks to Autodesk for this great addition since few previous versions. 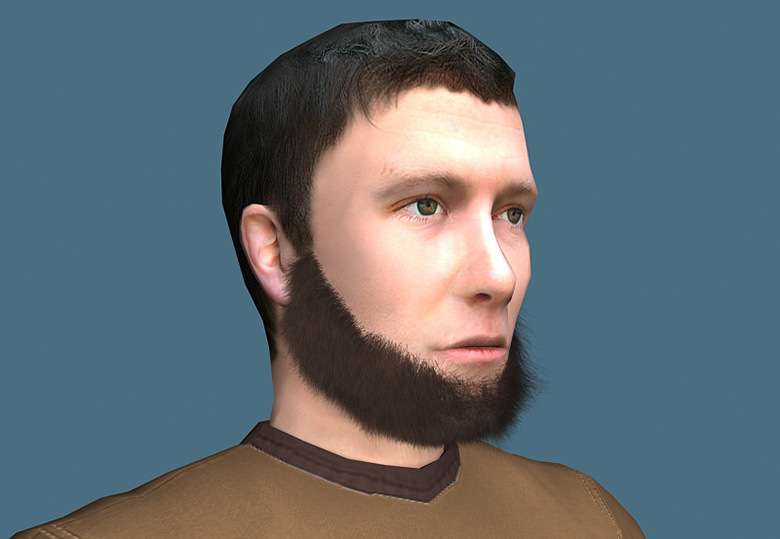 Fire up your 3ds max bring the character you want to experiment, since this is about to create facial hair for our character, so you have to select the faces where you want to grow hair from the face area, as you could see I have selected the faces where I want to grow hair from his face. It's time to detach the selected faces to have more control over the selected polygons, to bring them to the right shape by moving its vertices, now with polygon still selected from your ribbon or from editable poly option hit detach. From the detach pop-up do as in the image showing below. With new detached polygons, Go to vertex mode and refine the edges to represent smooth surface to grow believable hair from detached polygons. and now from the object properties uncheck visible to camera this will help us to hide detached surface from render. It's time to create our hair around the detached polygon faces, with detached polygons selected from modify panel drop down menu choose Hair and Fur as show in the image below. We will see the hair is visible now around the surface we selected. It's time to start tweaking the hair to represent proper beard around his face, please follow the highlights showing in the image below. Expand the Material Parameters and do the settings illustrated in the image below. As you can see the hair length is a bit longer, let's fix it, expand the Styling tab and click on the button finish styling and choose that scissor icon to cut out the extra hairs from his face, if you notice a green circle is available now, with that click on the tip of the hair to cut out, as showing in the image below. After I cut out the extra hair around his face. To deactivate the styling again click on Finish Styling button to deactivate and also uncheck display guides as well as play with percentage and Max. Hair parameters. Expand Multi Strand Parameters and change the settings according to your suit. Expand Fizz Parameters and Kink Parameters and change the settings shown in the image below. Again activate Finish Styling button and brush down his beard down to bottom to make it look realistic. Deactivate brush styling, so far so good we are done with our settings and need to check out what we have got by the settings we have done so far, lets have a test render. 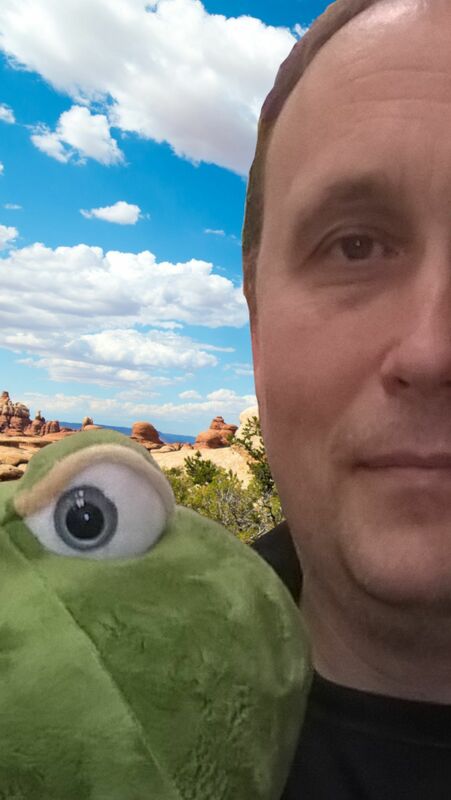 Here is my test render, play with your settings you will get interesting results.